India haven't lost a bilateral series in any format in 2017, but that's only if you discount the one-off T20I against West Indies in Kingston, where an Evin Lewis century blew them away. A 6-4 T20 record this year would suggest this Indian side is at its most vulnerable in the shortest format. Sri Lanka, having let slip a few chances to push India harder than they did in the ODIs, should therefore allow themselves to feel just a bit more hopeful than they otherwise might when they line up for the first T20I in Cuttack. This, moreover, is an Indian T20 side without Virat Kohli, Shikhar Dhawan or Bhuvneshwar Kumar, and with a long list of unproven names. Between them, Basil Thampi, Deepak Hooda, Washington Sundar and Mohammed Siraj have played a total of two international games, while Shreyas Iyer only made his India debut in November, and Jaydev Unadkat has played nine games across formats since his debut in December 2010. Sri Lanka will look at those names and tell themselves they have a more-than-realistic chance of winning this series. There's just one hurdle they'll have to cross if they are to do so, however; they have lost each of their last five T20 games. 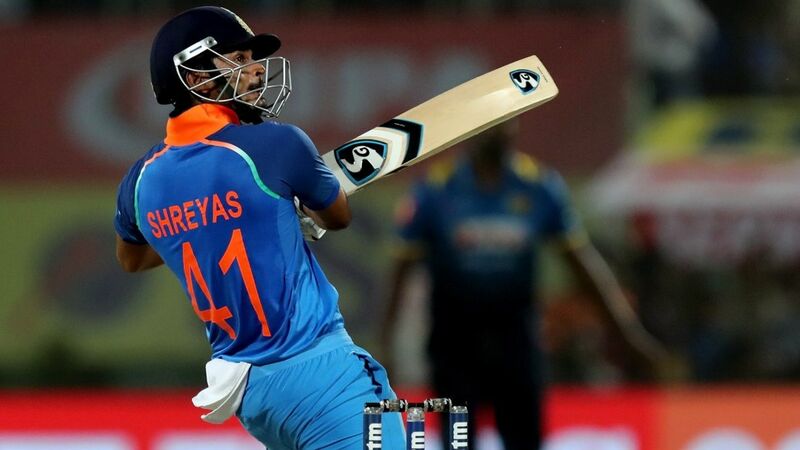 After a low score in seaming conditions in Dharamsala, Shreyas Iyer scored breezy, innovative half-centuries in the second and third ODIs, and didn't look anything like a batsman playing his debut series in the format. If he transfers that confidence and that ability to manipulate the opposition's fields into the T20 format as well, India might be closer than ever to solving their long-term middle-order issues in limited-overs cricket. During the ODI series, it was hard to tell if Danushka Gunathilaka was in form or not. He scored 1, 16 and 13, and was out all three times to Jasprit Bumrah, twice while attempting over-ambitious shots. He might need to temper his approach in the 50-overs game, but it might serve him well if he continues to go for his shots in the T20I series. Having missed out on ODI selection, KL Rahul returns for the T20Is, and should return in his natural role at the top of the order, alongside Rohit Sharma. With Bhuvneshwar Kumar rested, India will have to choose between Thampi, Siraj and Unadkat to partner Jasprit Bumrah in the seam attack. India (probable): 1 Rohit Sharma (capt), 2 KL Rahul, 3 Shreyas Iyer, 4 Dinesh Karthik, 5 Manish Pandey, 6 MS Dhoni (wk), 7 Hardik Pandya, 8 Kuldeep Yadav, 9 Jaydev Unadkat/Mohammed Siraj/Basil Thampi, 10 Jasprit Bumrah, 11 Yuzvendra Chahal. A number of senior players have returned to Sri Lanka's squad after sitting out the T20Is against Pakistan. Their line-up should closely resemble the one that played the ODIs, by and large, but without Suranga Lakmal, they will have to choose between the pace and bounce of Dushmantha Chameera and the left-arm swing of Vishwa Fernando to partner Nuwan Pradeep with the new ball. Sri Lanka (probable): 1 Danushka Gunathilaka, 2 Upul Tharanga, 3 Sadeera Samarawickrama/Kusal Perera, 4 Angelo Mathews, 5 Niroshan Dickwella (wk), 6 Asela Gunaratne, 7 Thisara Perera (capt), 8 Sachith Pathirana, 9 Akila Dananjaya, 10 Dushmantha Chameera, 11 Nuwan Pradeep. Cuttack has only hosted one T20I, in which South Africa bowled India out for 92 before strolling to a six-wicket win, amid crowd trouble, in 2015. It was an atypically bowler-dominated game at the venue. Either side of it, India have made 350-plus scores in ODI victories over Sri Lanka and England. After 63 T20Is, Thisara Perera has taken 45 wickets while conceding 8.95 runs per over. Among bowlers who have bowled in a minimum of 20 T20I innings, only two - Elton Chigumbura and Andre Russell - have a worse economy rate. AB de Villiers has 72 dismissals (7 stumpings, 21 catches as wicketkeeper, 44 catches as fielder) in T20Is, the most dismissals in the field by any keeper or fielder. MS Dhoni, however, could soon go past him. He is currently on 70 (45 catches as wicketkeeper, 25 stumpings). Sri Lanka won four of their first seven T20Is against India, but have lost four out of four since then. "As senior players, we try and help these young guys as much as possible, but all the young guys who've come in have come in with a lot of IPL games behind them. Some have played 20, some have played 30 games, so they're not as perturbed as they used to be in earlier days."